In the last post we have learned about erosion of concrete. Here we will learn about concrete composition required to resist erosion and testing method to evaluate erosion resistance of concrete. Erosion resistance is related to compressive strength of concrete, like abrasion, but concrete composition has also influence on this property of concrete. Hard aggregate in concrete is essential in erosion resistance. 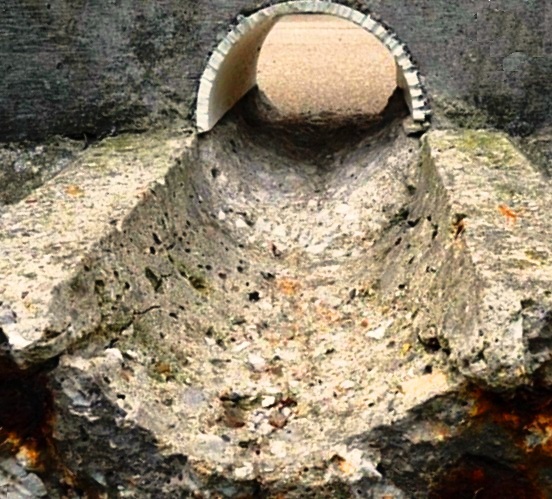 A study shows that a concrete mass having large aggregate suffer lesser erosion than concrete of having same strength mortar. But where it is required to erode exposed concrete surface to somewhat uniform, for a particular wearing condition, aggregate of smaller size performs better. For a particular slump, the resistance of erosion is seen to be increased with decreasing cement content in concrete mix. With the reduction of cement content erosion resistance is increased-are you surprised? Yes friends this leads to a reduction of laitance which makes the difference. Again for a particular cement, this resistance of concrete increased with decreasing slump. This is very easy to understand that a low slump leads to less workable concrete. But this concrete, if placed and compacted properly, will produce a high strength concrete. Naturally a high strength concrete has resistance to erosion. Irrespective of all conditions stated above, the concrete at the surface zone should be of good quality for this purpose. Dear reader we will discuss about vacuum dewatering and permeable formwork in the next post. These two procedures can be adopted for this purpose to have some beneficial effects. But whatever we do, under prolonged and severe erosion, even best concrete rarely withstand this situation.